Our Creatives-in-Residence program, designed in cooperation with Grand Central Art Center, broadens the traditional definition of community building and artist residencies. The program invites residents living in affordable apartment communities to participate in creative collaboration with artists, families and neighbors. Community Engagement supports the growth of this movement by providing training and funding to our Creatives as we work together to develop place-based programming. Amanda Evans' art practice is motivated by a desire to reconcile a meaningful creative art practice with radical social values. Often, her work involves long-term, community-based, public art projects that stem from her experiences as a teacher and maker. Amanda's educational background is in visual art, community development, and intercultural studies — most recently in the Art & Social Practice MFA program at Portland State University. She has worked on collaborative, interdisciplinary projects with groups including: neighborhood musicians, LA river community organizers, East Portland immigrant chefs, radio hosts with developmental disabilities, long-haul truck drivers, upper-middle class college art students, Turkish potters, evangelical conservatives, senior adult amateur photographers, and elementary student artists. Joseph Linnert is a community garden organizer and public art creative in Santa Ana California. As a teacher of incarcerated youth at probation camps in Los Angeles and a Youth leader in Santa Ana’s Boys and men of color project, as well as a Garden instructor in a Santa Ana Restorative Justice Program his work is focused on deep ecology and the connection between the individual and the environment. Mr. Linnert has an impressive number of years of experience in both Art and Garden installation, design, vegetable and herb growing and plant care, composting and sustainability measures. Trinh Mai is an interdisciplinary, California-based artist whose work is driven by innovative narratives of storytelling. Her artistic creations re-imagine personal memories, family roots, and spiritual connections that alter conceptions of our identities and shared histories. Since receiving her B.F.A. in Pictorial Art from San Jose State University and furthering her studies at UCLA, Trinh has exhibited nationally, as well as showing in public and private collections internationally. Her passion for intermixing arts and collaboration has inspired her community involvement. She has served as Project Director for the Vietnamese American Arts & Letters Association (VAALA), Master Teaching Artist for the Bowers Museum, Course Developer for the Pacific Symphony, and Curator at the San Jose Center for the Performing Arts. Dino Perez is an Urban Creative from Santa Ana, CA. He received his Bachelors of Science Degree in Graphic Design from The Art Institute of CA - OC in 2011 and has been working as a full time Graphic Designer since. He is also an illustrator and enjoys painting with acrylic, his illustrations have been used in promotional posters for Ellie Goulding and Morrissey by Goldenvoice Productions and his paintings have been in numerous art shows. Dino was selected by the City of Santa Ana to paint a utility box on the corner of 4th and Bush in 2014. He also displays and sells his artwork every first Saturday of the month at the Santa Ana Artwalk which he has been a part of since 2010. Dino's newest project, Coloring with the Community was created to bring people of all ages together through the magic of coloring. Erin V. Sotak received her BFA from The University of Arizona and her MFA in photography from San Jose State University. 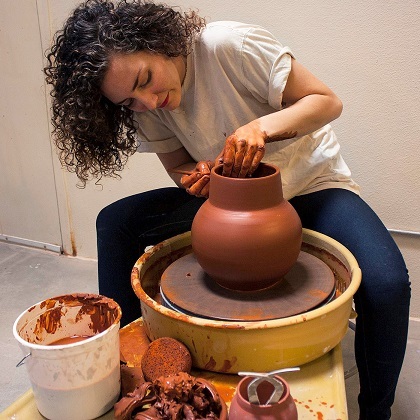 She has exhibited both nationally and internationally at such institutions as the Phoenix Art Museum, The Scottsdale Museum of Contemporary Art, ASU Herberger Museum of Fine Art, Dallas Center for Contemporary Art, UCSC Sesnon Gallery, Women and Their Work, and Centro de Artes a La Universidad Eafit. She was artist in residence with Scottsdale Public Art and Salt River Project 2014-2015 creating My Your Our Water which has traveled through 11 states, and was in residence at BreckCreate in Breckenridge, Colorado. Erin began working with an at need community in Phoenix, Arizona in 2014 as part of an initial pilot program with Grand Central Art Center and AHA. Erin is currently beginning her third year of this social practice residency at Whispering Pines now with Community Engagement.